After watching the newest addition to the Marvel Cinematic Universe, I was able to compile my favourite quotes or pieces of conversation from the movie in the format of a top five. This was part of the first conversation between Doctor Strange and the antagonist of the movie; Kaecilius. I know it sounds like a character from Greek mythology but Mads Mikkelson pulled it off quite well. Definitely more intimidating than Christopher Eccelston’s Malekith in Thor: Dark World. This is exactly the type of banter that makes the Marvel movies such a joy to watch. The ancient words of… well, The Ancient One are very enlightening and they’ve definitely left an impression in my mind. Mysticism is something I have a longing interest for so might pursue it a little. I probably won’t get anywhere near Doctor Strange’s level but as long as it is of benefit to me in some way and there is no harm, I don’t see why not. The Ancient One: You’re a man looking at the world through a keyhole. You’ve spent your life trying to widen it. Your work saved the lives of thousands. What if I told you that reality is one of many? Life becomes a lot easier to bear if you live with the idea that there are multiple universes and our reality is just one of many. Things could have panned out in a more positive light for each individual in a parallel universe. This third quote is more iconic than anything else. I don’t want to post any spoilers but those that have seen the movie; this is definitely one that sticks. Doctor Strange: Dormammu, I’ve come to bargain! I guess I could put this down for the final two spots as well but that would be trolling. 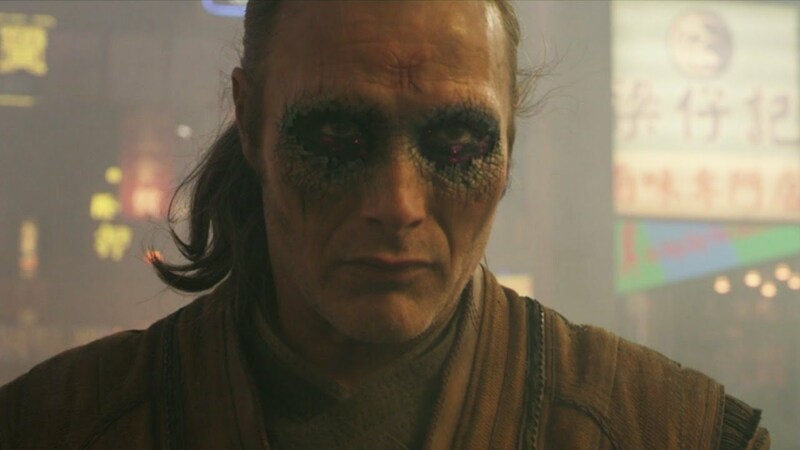 There is a point in the movie where the Kaecilius attempts to persuade Doctor Strange to turn to the dark-side. No, this is not Star Wars but this is pretty much a common cliché in fantasy. Doctor Strange: What are you talking about? Just look at your face. Doctor Strange was referring to the dark patches of evil under his foes eyes for payment to his service to Dormammu. Like you’re trying to tell me this is the best thing in the world and you look like that? No thanks mate. I mean looking at the picture above, I guess he had a point. This is just the quote that stood by me the most and pretty much summed up everything about Doctor Strange for me as a movie and as a Marvel character. The Ancient One: It’s not always about you. Like I mentioned before, The Ancient One is wise. People like Stephen Strange and Tony Stark have this huge opportunity to help the world yet they somehow make it more about themselves than anything else. They have huge egos and although they are great to watch, deep down they do what they do to satisfy themselves. It is always about them. These superheroes may think it’s all about them and so do the fans but it’s actually about the overall rather than the individual. Having said that, I was totally Team Cap in Civil War so kind of makes me a hypocrite but come on, we had to save Bucky! I hope you liked this post. Let us know what you thought below about the movie and what your favourite quote was. Feel free to subscribe to Sleeping Geeks via email so you never miss a post. Team Captain all the way man. That bromance really hit home for me. And I yeah I know what you mean, the whole “call me doctor, I worked hard to earn that title…” I get it. He’s proud and it really reflects his personality. Even after going through the spiritual enlightment, he’s still the same guy deep down. Aw yeah Team Captain. I pick America any day haha. Yeah even after going through training, he still wants to be called Doctor. Doctor Strange looks like a promising movie. I can’t wait to see how he interacts with the rest of the superheroes in the marvel universe. Can you imagine him having a conversation with Iron Man or Starlord? Or even Steve Rogers? Haha yeah it would be funny. I can see Tony Stark complementing his beard. I’ve seen some strips from their engagements in comics and its absolute banter. Haha I am definitely ready to see him along with the other heroes. I am pretty sure his powers will be a great assist for future films.